Next one, a Semitransparent Snake. This was hardly worth constructing, since the competition puzzle was only worth 20 points. Also the type is somewhat dreadfully confusing. But, enjoy! 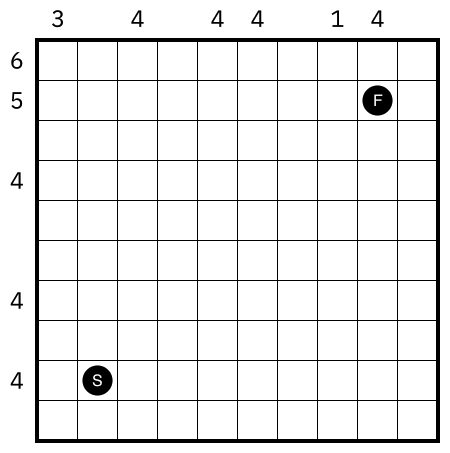 Rules Connect Start to Finish by a standard snake. Clues count the visible snake cells. Along any straight segment of snake cells (in the direction start to finish), every 4th cells is invisible (from both directions). This entry was posted in Puzzles and tagged semitransparent snake, snake, variant on 2018-11-14 by rob.